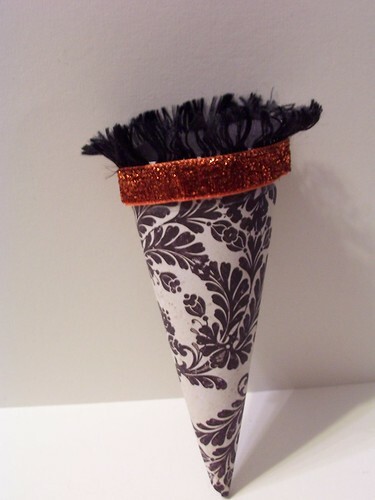 I am yet again rushing to complete all my Christmas crafts. 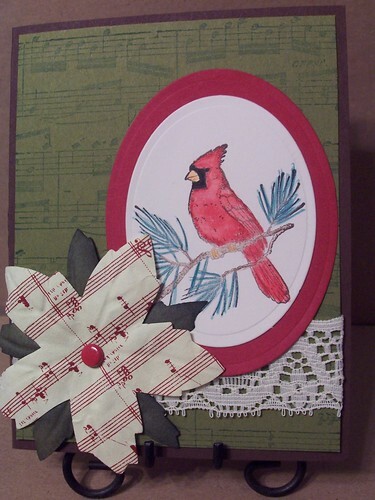 I wanted to stop in and share a little music themed Christmas card I created for the weekly challenge at Inspire Swap Chat. I am not normally a tag maker. I love to look at them but the tag as a blank canvas does not usually spark creativity in me. 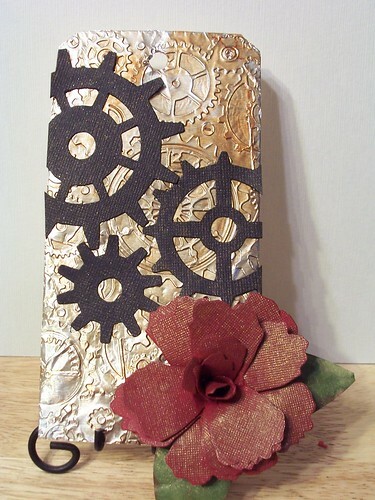 Since I've been playing with the Tim Holtz dies I have found new inspiration. So much inspiration that I created a class of 4 art tags. I love autumn. I love November. In Texas it's a mix of warm days and cool nights with the occasional wet and cold day. It has taken me a long time to adjust to fall in Texas, the changes are not as dramatic but the trade off is the days are still warm enough to get out and about. 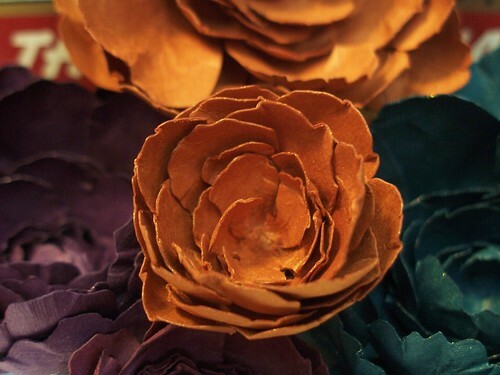 I have some autumn flowers to share with you. 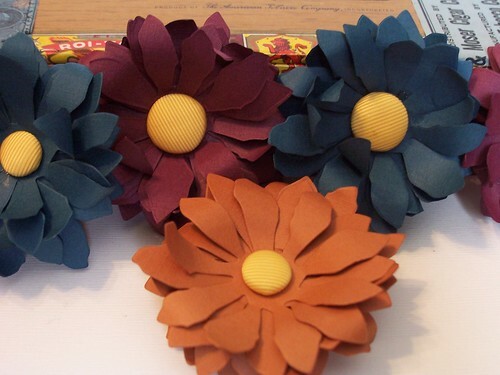 Making flowers has become quite the phase for me. 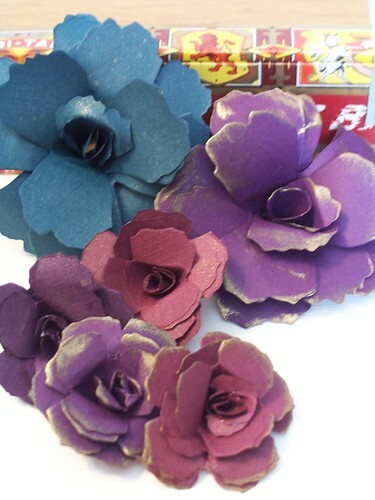 On the plus side I'm giving my Tattered Florals die from Felicia's Scrapbooks quite a work out. I call these peonies. 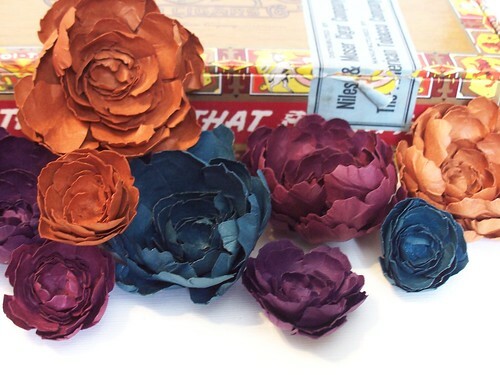 Or maybe cabbage roses? And last but certainly not least my daisies. There are only 2 more days until Halloween. 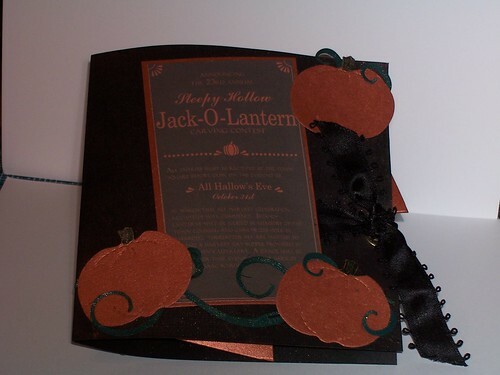 Truthfully, I'm ready to put the ghosts and witches away and trade them in for some fall foilage and Christmas goodies. 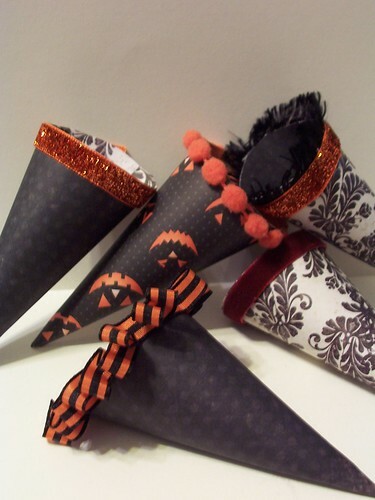 Today I am sharing some little Halloween cones I made. I don't remember where I saw them at the first time but they remind me of Tussie Mussies. I just used some scraps and trims I had laying around. They were fun to put together and I think everyone will like them! 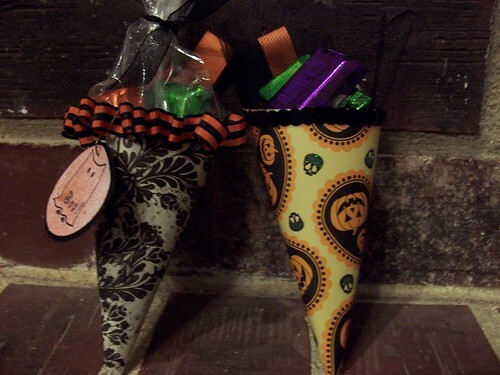 and here they are filled with goodies! 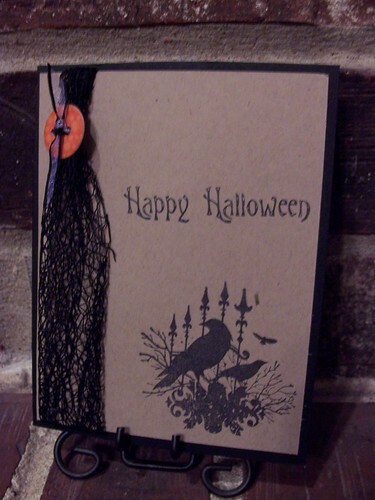 I have been finishing up the last of my Halloween projects. 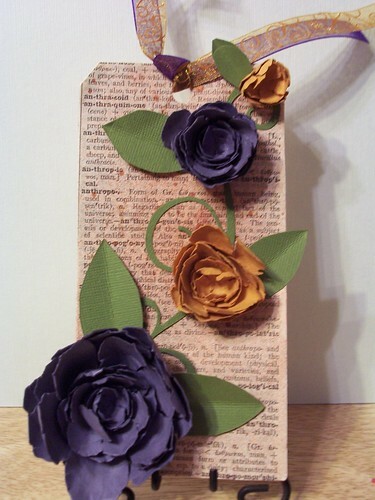 Today I am sharing one of the cards I made to send to my parents. I'll share the other one tomorrow. I can never settle one just one card for them. 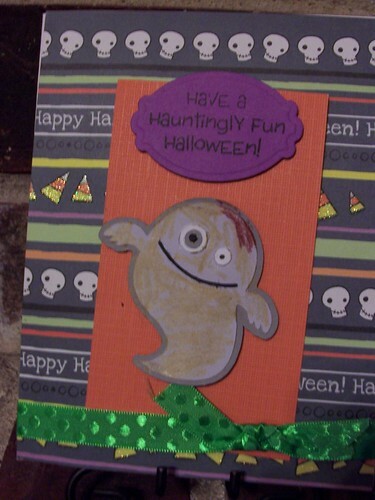 This year they are getting 4 cards as both kiddos made a card for them. 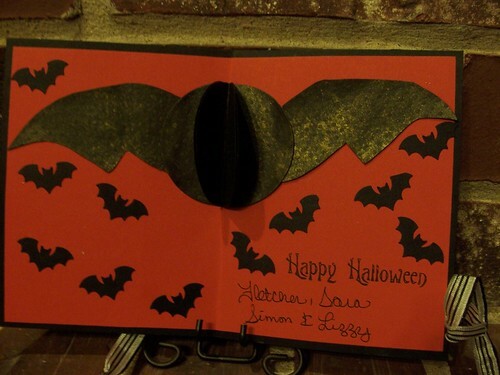 The kids took advantage of some great Halloween card kits I received in a swap at Inspire Swap Chat. They had some help with cutting the paper as I don't let them use my paper trimmer. It's a rotary blade and I have cut myself a few times on it. The design is all theirs. 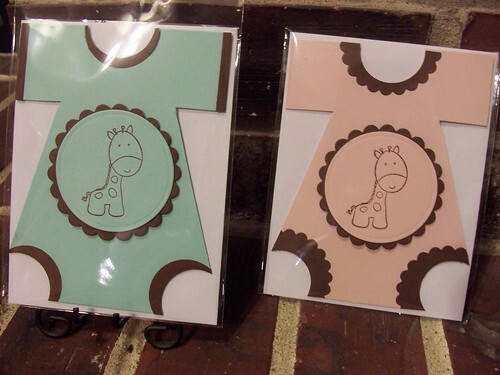 I had a request to make 2 boy and 2 girl baby cards. I don't really have much baby stuff. 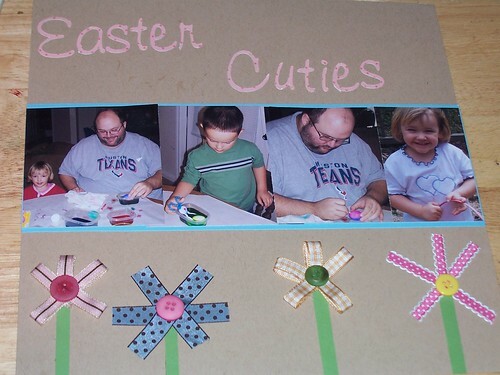 I was not much of a card maker when I had my kids and I just don't know that many people with babies. I had a stashed baby girl card but nothing for the boys. 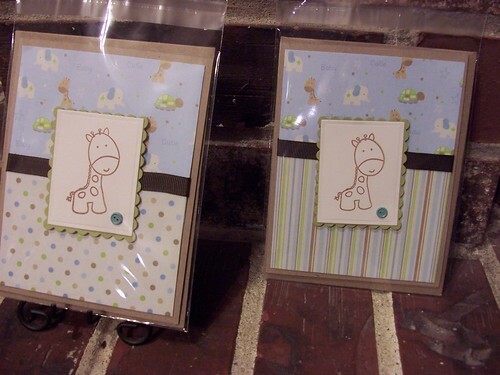 I ended up making a onsie card and another little cutie with a giraffe stamp. The onsie cards are super easy and very cute. I'd show you a tutorial but there are like 100 of them out there. Aaah it's Christmas time or at least time to get crafting on those Christmas items! 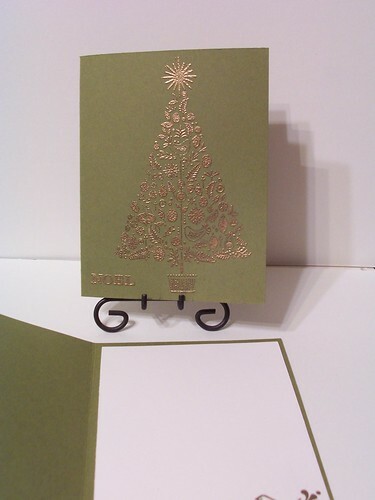 I am still friends with my embossing powder so my cards today feature embossing. 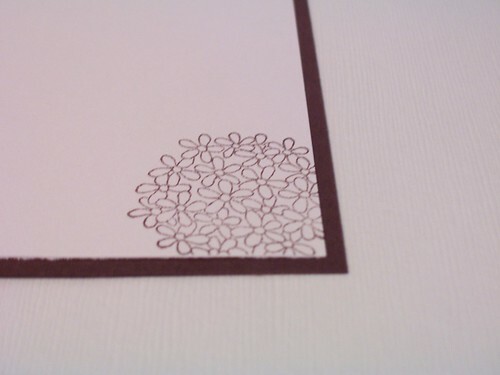 It makes a simple card elegant. 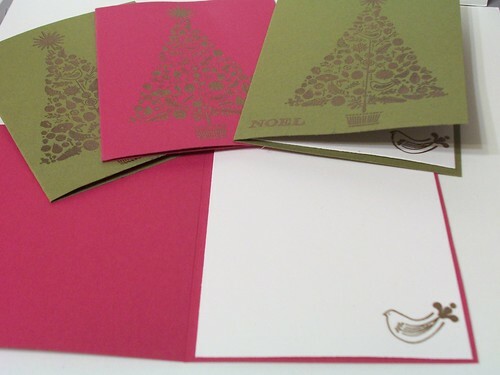 The partridge in a pear tree cards are available in my etsy shop. This card I created specifically for my brother. He likes Alice in Wonderland and under much protest and complaint, loves frogs. When I saw this little frog I knew he was getting it on a card! 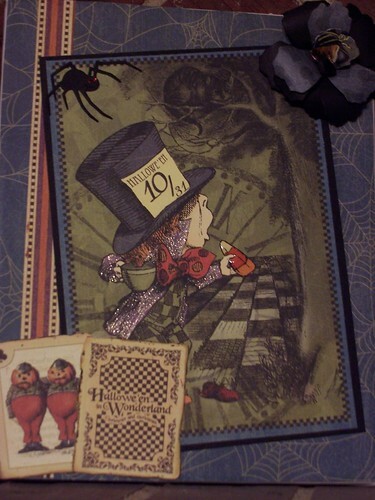 I am still very much in love with my Halloween in Wonderland papers by Graphic 45. 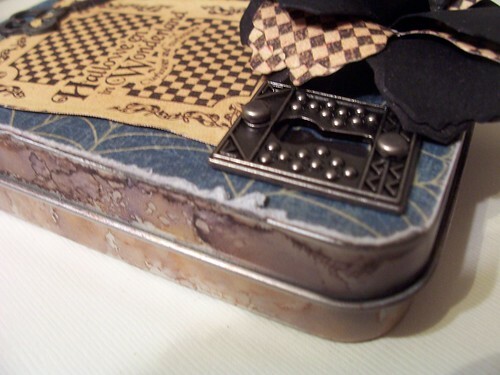 I altered this tin and created a mini album full of little details all from a couple sheets of paper! 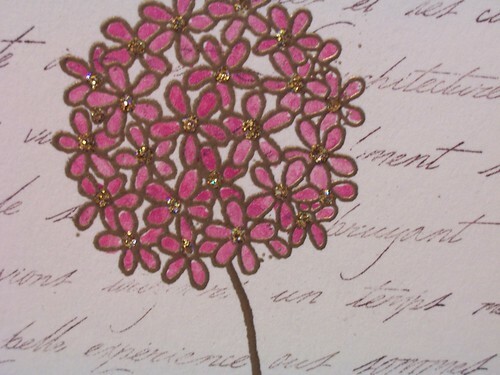 I wanted everythign to shimmer, sparkle and have a touch of vintage feel to it. I am sorry I had you both shoved to the back of the craft bin. In all fairness, you are both fickle friends. Some days you produce beautiful works and other days you make me want to drown you in the kitchen sink. To my embossing powder: I think I have finally found the missing piece in our relationship--the embossing buddy. With this little guy we have been able to create several successful cards in the last few weeks. To my watercolors: I have found the correct amount of water to add and additional "swirling" time to make you work right. I promise to pull you out and use you more as I really do like the results the three of us come up with. However if you become fickle again, I will stash you in the back of the bin again. There are so many options that I can't be bothered with fickle supplies. While I was at home working, Simon and Lizzy spent the summer with Grandpa and Grandma having great adventures. One of those adventures was a backyard camp out. Simon has been camping before with Grandpa, but this was Lizzy's first time to sleep out under the stars. I really liked using the Cosmo Cricket Mr. Campy line. 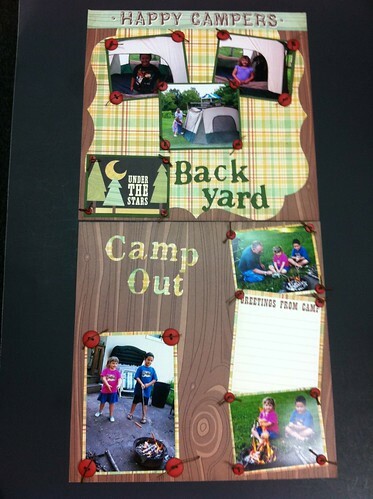 Besides being super cute, it comes with a sheet of title strips and a sheet of journaling blocks. The hard part was narrowing it down to what would fit on my page. I have some more adventures with the grandparents that I will be scrapping with Mr. Campy. 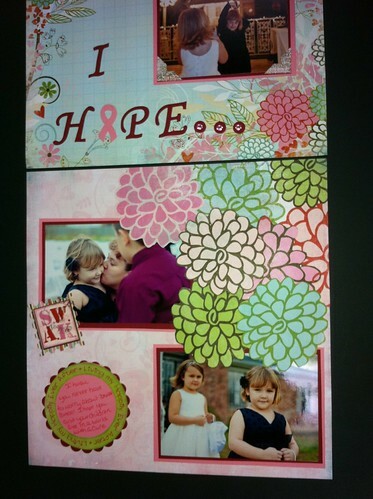 Bo Bunny gave product to scrapbook stores for their customer's to use for a layout about how breast cancer has affected you. I created the layout below. 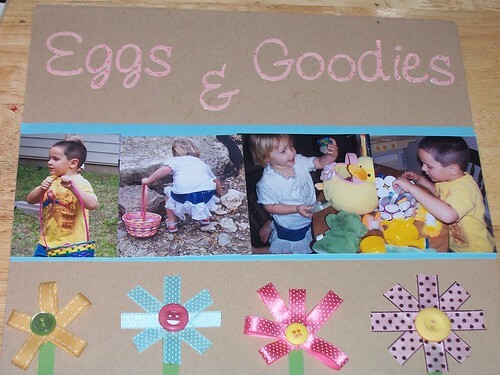 It has all Bo Bunny products except 2 colors of Bazzil Card Stock. 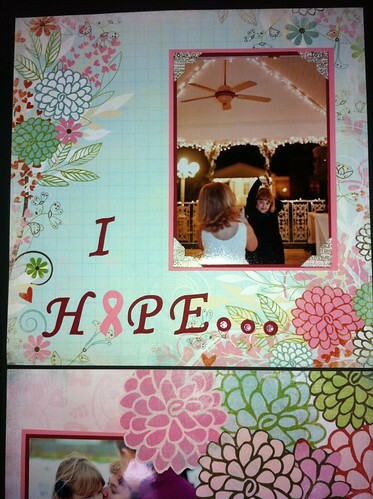 The journaling says: I hope you never have to worry about breast cancer. I hope you and your children live in a world where there is a cure. 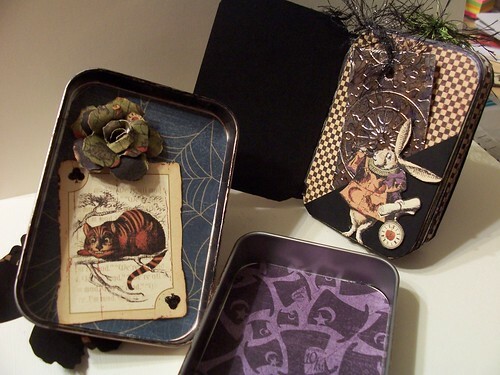 Have you seen the Halloween in Wonderland collection by Graphic 45? 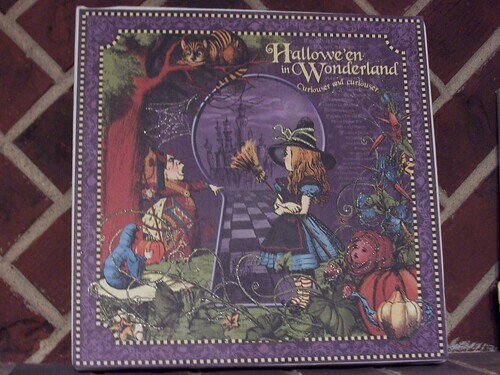 I fell in love with it the first time I saw it and immediately had Felicia at Felicia's Scrapbooks order it for me. Of course when I ordered it, I had no idea what I might do with it. 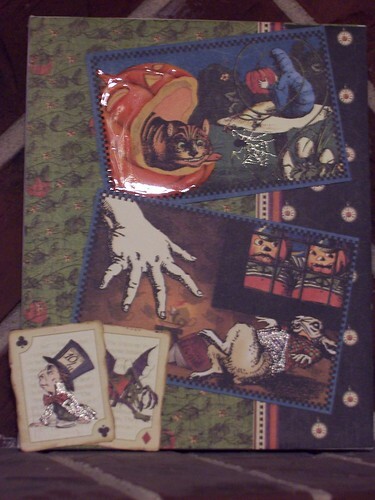 The papers are mostly Alice in Wonderland with just a few touches here and there to make it Halloween. 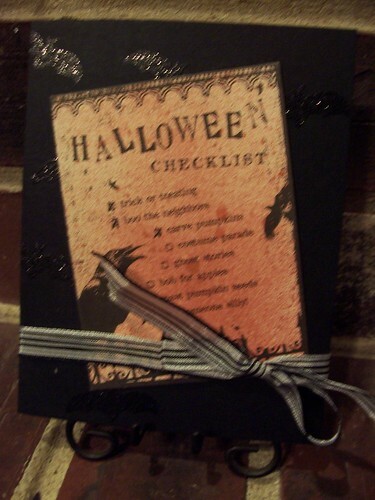 I will be using many of the papers and elements for non-Halloween things. 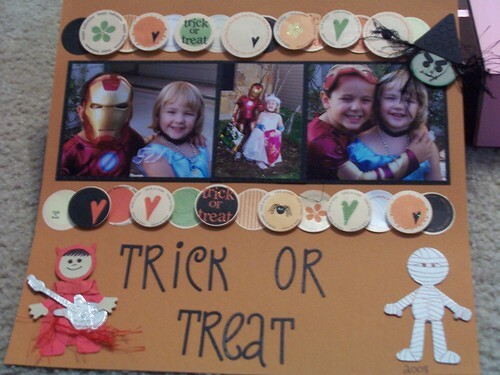 I started with Halloween by making some wall art to go on our mantle. I have had some canvases for quite a while so I finally pulled them out to use when I went to the Scrap Pink crop this weekend. As you can see, it didn't take a lot of embellishing to create these. The papers are so wonderfully detailed. I added some star dust pen and a little glossy accents and I was finished. My cousin just had his first baby. 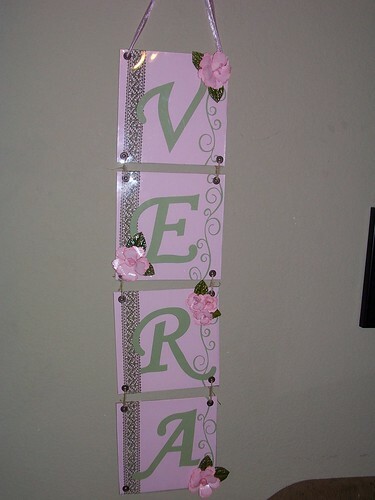 They named her Vera Rose. I thought it was such a pretty name. 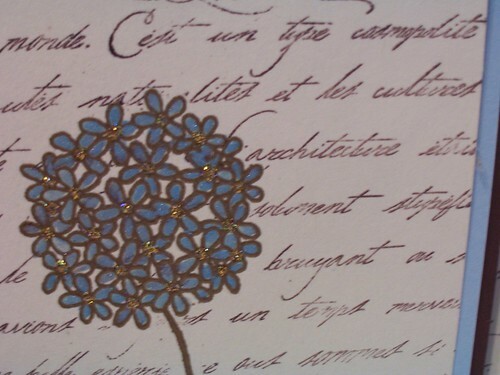 I wanted to send them something for her room. I ended up making a name wall hanging. 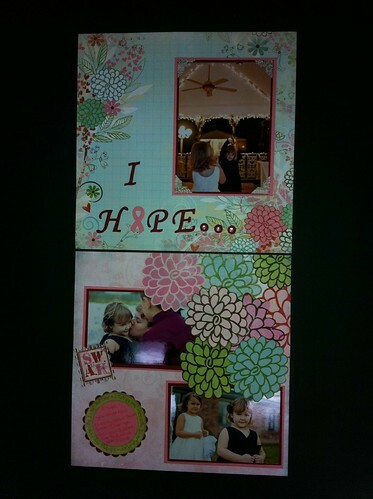 I got the idea from Felicia at Felicia's Scrapbooks. The lace was white and I dyed it with Vintage Olive Glimmer Mist. 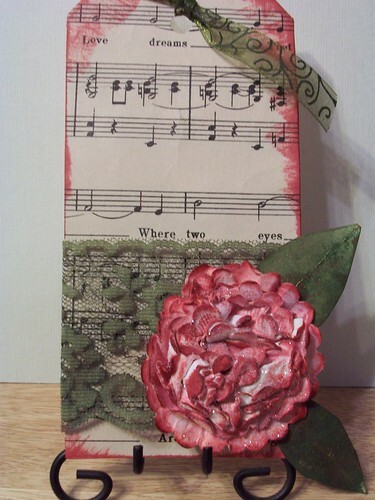 The roses were made using the Tim Holtz tattered florals die. The leaves were some leaves I had from a package but the colors were off. I used the Vintage Olive Glimmer Mist again to make the leaves match my project. Just a quick post today. 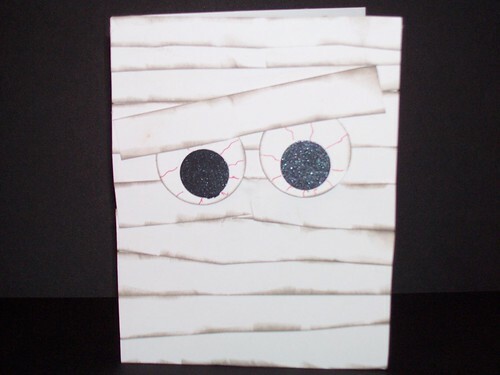 I wanted to share my no stamping mummy card. I like a quick card like this to have in my back pocket. This one is one the kiddos can make too. 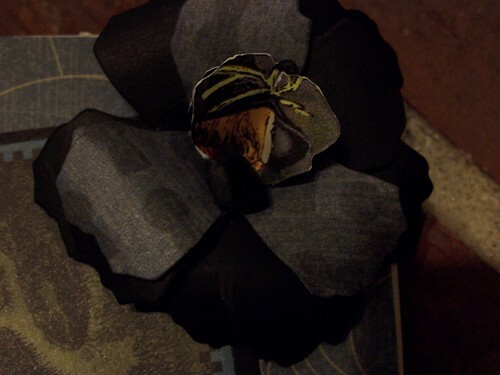 The concept is simple, tear strips of white paper, punch a couple of circles, ink the edges and glue it all down. Other: Red pen, wipes for messy fingers. 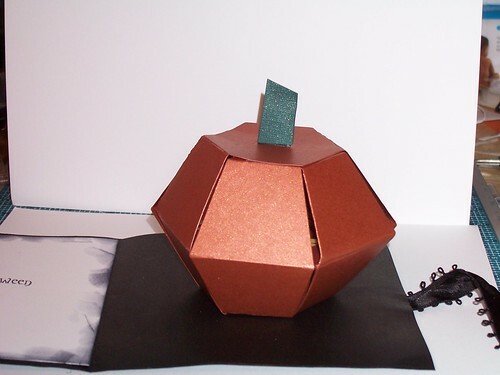 I can't believe it is already time to start creating for Halloween. It is still blazing hot here and I feel more like swimming than trick-or-treating but I pulled out the Halloween stuff anyway. I love the Halloween stamps Inkadinkado has out there. 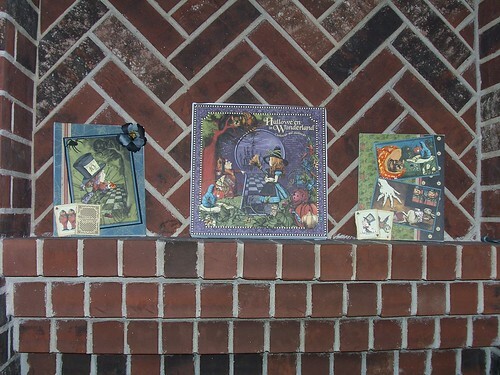 My all time favorite though is the witch on her broom. 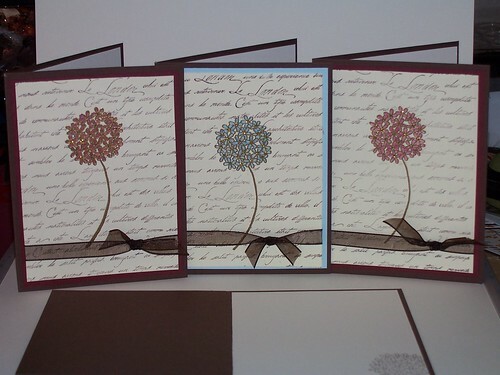 I think it is a stunning image and makes a great card with little effort. For some reason I always feel like witches should be paired with purple. I have no idea why but I do. 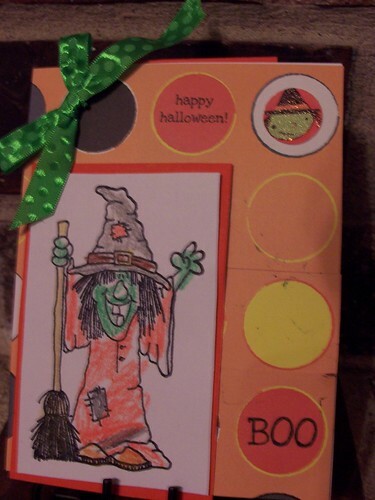 I envisioned my witch on this card flying in the wee hours of the morning. This card is fairly simple. I started to brayer it but was too lazy to drag the brayer out and clean up after it. 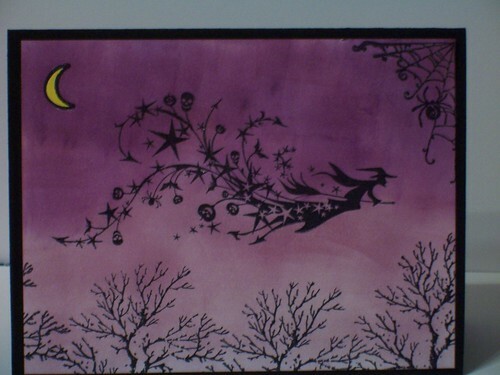 I stamped my images in Archival black and then sponged the purple on starting with the lightest color. I finished it off with the stardust pen. 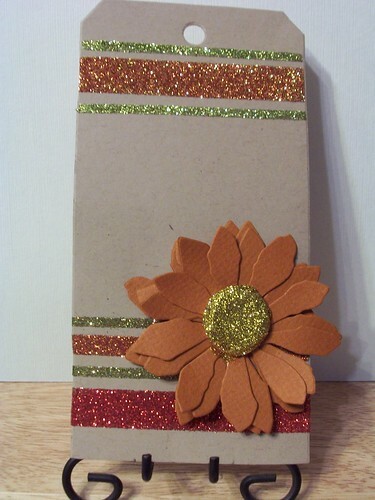 Just a card base and one layer of white card stock. 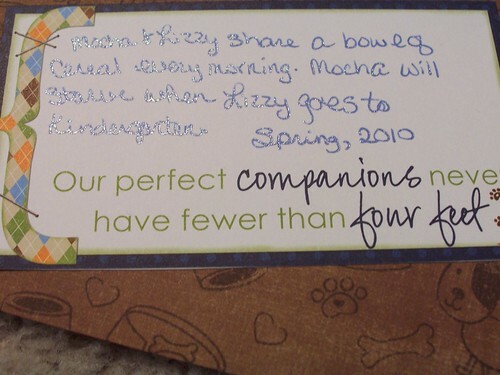 For the part of the past school year that we had Mocha, Lizzy has gotten up pretty much every day and shared a bowl of cereal with Mocha. Mocha is very patient and waits for a cocoa puff or cheerio to be offered. At least until no one is looking and then the bowl is hers. We are so happy to have her though. She is Lizzy's best friend. Bo Bunny has a lot of lines out there right now. 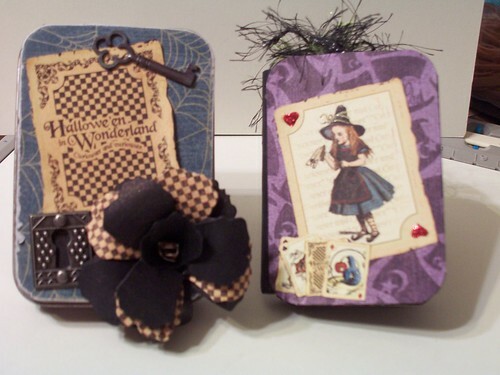 They all seem to have one sheet that has these blocks for journaling and embellishments. They are really neat since it matches perfectly with the line and it takes little effort. Another blast from the past here. We're headed back to the fall of 2008 again. 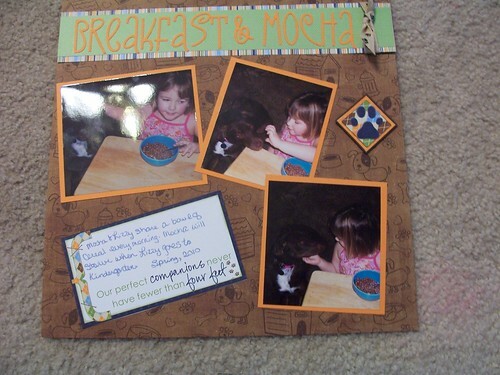 The circle border was all punched from one sheet of paper (really about 1/3 of it). It had these awesome circles and it was expensive so I wanted to use it to its full potential. 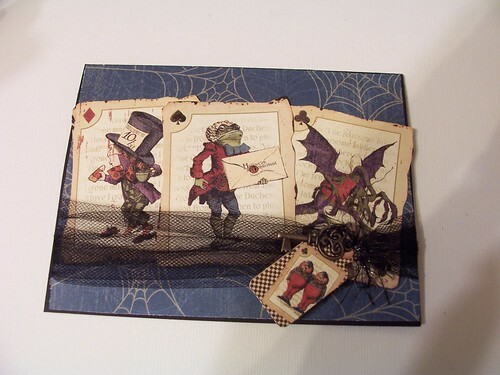 The cool little Halloween guys were from a swap I did on Inspire Swap Chat. Unfortunately I don't remember who made them but they are perfect.